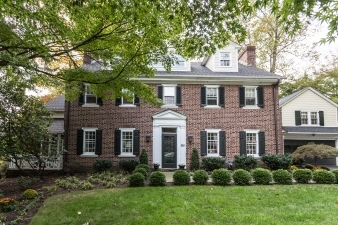 Classic Georgian Colonial ideally located on a sought after cul-de-sac in a fabulous walk to Wayne neighborhood. This home has a welcoming center hall, gracious Dining Room with built-in corner cabinets, large Living Room with fireplace and access to a private side covered porch, and a door to a bright sunroom/den with built-ins. The kitchen has stainless steel appliances, corian countertops, large island and opens into a family room with a cathedral ceiling, built-ins, large Palladian windows and sliding door to a flagstone patio that overlooks a large, level fenced in backyard. The first floor also has a powder room and mud room that accesses the two car attached garage. The second floor has a large Master Bedroom with a master bathroom, and two walk-in closets. There are three other bedrooms on this floor, two full bathrooms and a second floor laundry. The new open and sun-filled third floor has two large bedrooms and a new full bath. The lower level has been finished into a playroom with storage.